The swimming team at Bishop Road School have completed another successful year in the pool. 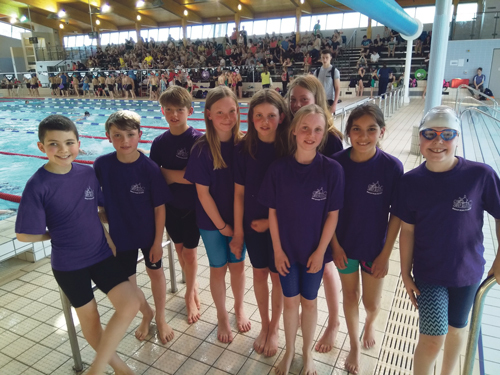 The team competed over six rounds of the local Percy Smith Gala League, ending up in a creditable fourth position, and also took part in three development galas organised by Bristol Penguins Swimming Club. The main successes were saved for the major competitions of the year. Nine children made it through the highly competitive qualifying heats to represent the school in the final of the Bristol Schools’ Swimming Championships, and across the individual events they claimed a total of four gold medals, four silver and one bronze. In addition, the girls’ medley and freestyle relay teams both finished in first place, thereby earning a trophy for the school, and they also picked up the silverware for the overall girls’ points trophy. The final event was the inaugural canon relay, and a mixed team of boys and girls once again triumphed in a dramatic finish to make an overall haul of four of the seven trophies on offer. Just two days later, the boys and girls relay teams travelled down to Millfield School in Somerset to take part in the south-west regional heats of the English Schools Primary Team Championships. Despite swimming superbly, the boys narrowly missed out on qualification for the national finals, but the girls became unofficial south-west champions by finishing first in both the medley and freestyle relays. The finals were held at Ponds Forge swimming pool in Sheffield in mid-June against the top swimming schools in the country. In an elite-standard competition for this age group, the girls acquitted themselves superbly, recording their best times as a team and qualifying for the B final in both events where they finished 5th, and therefore 13th overall in the country.